Over the past few weeks, I’ve been developing a theory about where online display advertising is today, versus where it needs to be. It seems to me that, for all the harping that goes on about new media versus old media, we’ve reached the point where display ads should be considered old media and therefore are due for a change. I think I have some answers, I know that I’m missing many, but it’s time to put some thoughts down and see where they lead. In the past I’ve trumpeted loudly about how advertisers make mistakes. One of the most important, poor decisions is judging the efficacy of advertising campaigns by click-through rate (CTR). The metric essentially says that if people aren’t clicking on an ad then it’s not effective. The logic, then, is to do whatever it takes to draw more attention to the ad. This leads to mistake number two, which is choosing the advertising that is most invasive. Let’s put this into real-world parallels, so you can see how absolutely insane the line of thinking is here. Let’s say that Joe’s Pizza wants to advertise. So they rent space on a billboard. But people aren’t coming in to get a pizza and saying that they saw the billboard, so Joe thinks it isn’t working. The next step is to make that billboard more notable, so Joe has flashing lights, and maybe a video screen installed. But people still aren’t responding, so it’s time to ramp things up yet again. This time, instead of just being a billboard, now Joe has a guy holding a sign in front of you on the road. The light is green, but you can’t go because you have to wait 15 seconds for this guy to move. 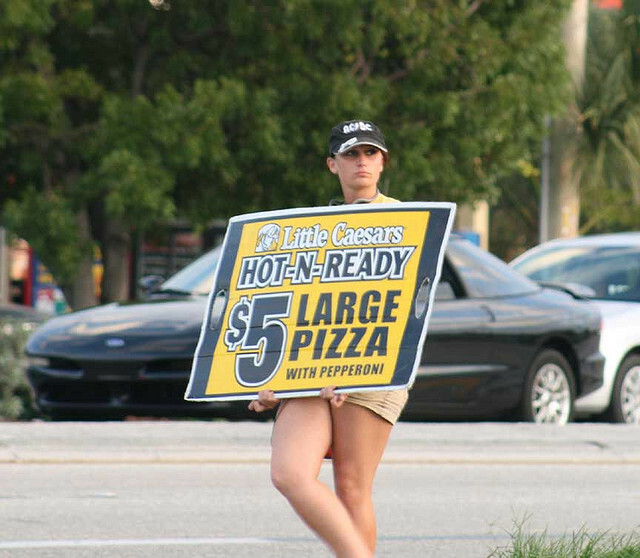 Oh, and if you happen to choose a trip to Ted’s Pizza instead, the guy from Joe’s is going to be there, flashing his sign in your face even as you’re walking out the door with your pizza in hand, post-purchase. Can you spot the crazy? Targeted advertising, be it the fault of technology or simple misunderstanding, is aiming to be as annoying as possible. Worse yet, even after a purchase decision has been made, Joe’s still spending money to get his message in your face, even though you’re not buying a second pizza that day. So if we shouldn’t measure success via CTR, how then are we supposed to decide what’s working and what’s not? The answer comes down to something that effective marketers have been using for years, yet it seemed to be largely forgotten once the Internet became mainstream. No one platform is the be-all, end-all answer to your advertising question. Generating top-of-mind awareness (ToMA) for your brand requires a multi-faceted approach, and no amount of CTR is going to prove that it’s working…or failing. Because ToMA isn’t measured by clicks, but rather by transactions. If I say cars and you think Ford, then the company’s been effective in its ToMA efforts. But I’m going to take Ford’s statement a step further, and say that the company understands that display advertising is only part of the solution. Combined with television, direct outreach, radio and many other methods, Ford has seen effective results from its Facebook campaign. This goes back to a simple truth, known in marketing as the “Rule of 7s”. Essentially the Rule of 7s says that a customer needs to see your brand seven times in order to remember it. More specifically, it needs to see an ad seven times in order for that ad to stick with them. In short, you have to get away from CTR in order to appreciate what ads are doing for you. The idea of metrics becomes something that’s considerably more difficult to track, and advertisers fear what they can’t measure. It used to be that you’d frequently hear the question “how did you hear about us?” when you were completing a transaction. It was a way that companies could find out what parts of their advertising campaigns were most effective. Maybe they were using four or five different mediums, but if they only heard about one of them, they knew it was time to change how they were utilizing the rest. I’d be interested to see what could happen if Internet advertisers began to do the same. Let’s say that the question is part of the check-out process, or perhaps it’s included in the request for information. I don’t think it needs to be a required field, because more requirements leads to lower completion rates, but it certainly wouldn’t hurt to include the inquiry. Unfortunately it’s only one step toward a solution to a larger problem. Internet users are getting more savvy, average CTRs of display ads are dropping rapidly and companies are looking for more effective ways of delivering their message. When you consider that a CTR of 0.2-0.3% is considered normal (PDF link) it becomes painfully obvious that the ads aren’t the selling point, but rather they’re serving a part of a larger goal. As a content producer, I’m fascinated by how innovative companies are handling the display ad transition. As a long-time marketer, I know that it’s an intricate problem with no single answer. But the change has to start somewhere, and simply asking a customer where they heard about you can offer a wealth of insight that you might not otherwise have had. I’m not fool enough to think that a single step can solve the entire, complex issue. But I’m just naive enough to believe that customers can still appreciate good advertising, as long as companies are willing to understand what that takes.